We most often hear that the “average” 65 year old will eventually need 3 years of LTC. However, the amount of care actually needed varies widely. Below is a chart of the number of years of care needed by the general population. You can see that 31% of the population will not need any care. Another 17% will need between 0-1 year of care. 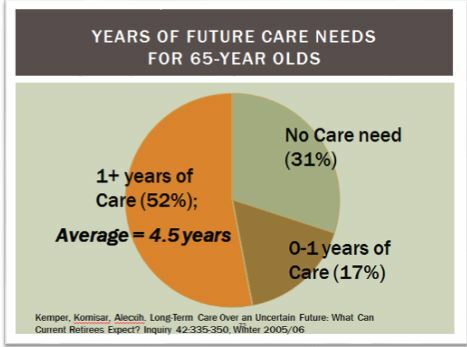 The remaining 52% will need more than one year of care. Importantly, this group that comprises 52% of the population will need, on average, 4.5 years of care! There are two other important risk factors. Women use almost exactly twice as much care as men. Much of this is due to the greater longevity of women. When you look at the above graph, most of those in the left side of the chart (those needing 1+ years of care) will be women and most on the right side (needing 1 year or less of care) will be men. LTC risk is closely correlated to one’s lifespan. Someone who lives to age 92 has a much higher chance of needing LTC and also has a higher risk of requiring care for a longer number of years than someone who only lives to age 80.